Source: Horatius Bonar, Hymns of Faith and Hope. New Edition. (London: James Nisbet & Company, 1867), pp. 201-204. Story that shall ever last. That this earth has ever known. Here on earth a life began. Mary's infant, lays His head. Heaven and earth conjoined in one. And yet hating none again. Blesses, comforts, saves, and loves. Shine with heaven's most glorious light. 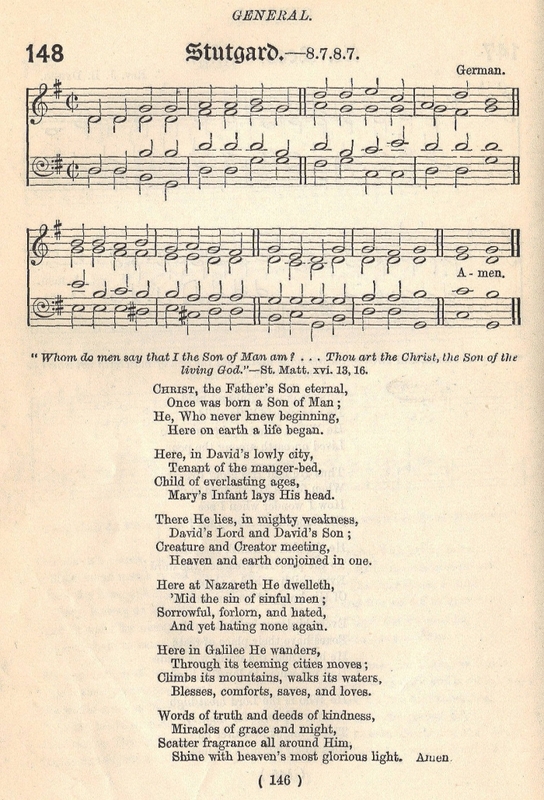 Sheet Music "Stutgard" from Mary Palmer and John Farmer, eds., Church Sunday School Hymn-Book (London: Church of England Sunday-School Institute, 1892), p. 146, #148. Only the first six verses are reproduced from this much longer hymn of 17 stanzas. The seventh stanza begins: "In Gethsemane behold Him, | In the agony of prayer." Compare: Come And Hear The Grand Old Story. This edition of Bonar's hymnal is available at the Internet Archive, Hymns of Faith and Hope. Quite a few editions of this hymnal were printed. This edition, in particular, diverged in content from others both before and after. It is also found at Google Books.